AR/VR is the next big thing for businesses. They need partners to help them figure out what they need and how to get there. Augmented reality (AR) and virtual reality (VR) are not pie-in-the-sky future technology fantasies. Real-world enterprise applications are here today. As the hardware, software and services around AR/VR continue to mature, this is not an opportunity partners want to miss out on. IT departments might not know where to start when it comes to AR/VR, but the line-of-business (LOB) units are not so reticent about embracing this technology and leading the charge, often circumventing the corporate IT department in the process. Clearly, businesses need help. “Over the next 18-24 months, IT folks are going to need a crash course and good partnerships so that they don’t find themselves running to catch up or playing from behind,” Tom Mainelli, vice president devices and AR/VR at IDC, told us. The market research projections tell the story. The 2018 AR/VR forecast is projected at $17.8 billion, representing an almost 95 percent increase over last year’s figure of $9.1 billion, according to IDC. The commercial sectors will represent more than 60 percent of AR/VR spending in 2018 and grow more than 85 percent of the worldwide total in 2021. Five commercial sectors are forecast to see triple-digit spending growth throughout the forecast period. The public sector will top the growth forecast with a five-year compound annual growth rate (CAGR) of almost 157 percent. On the commercial side, distribution services are expected to be the largest sector with $4.1 billion, led by the retail, transportation and professional-services industries. Manufacturing and resources, at $3.2 billion, will see balanced spending across process-manufacturing, construction and discrete-manufacturing industries. Retail will have the largest AR/VR spending in 2018, followed by process manufacturing and construction, IDC reports. There’s no shortage of industry hype about AR/VR, and with it comes a lot of branding terminology; for example, Microsoft talks about mixed reality, Intel uses the term merged reality, and Samsung refers to immersive reality. In fact, Microsoft recently expanded its Mixed Reality Partner Program, that initially kicked off as the Agency Readiness Program at the Microsoft Build 2016 conference. At that time, the program targeted digital-marketing agencies. “The whole point of that was that we realized pretty early on that building a mixed-reality application was different than building a Windows application. [Building a mixed reality application] requires that people are thoughtful at the outset of the process about the design of the user experience and [user interface], and it requires some degree of artistry,” Paul Corriveau, director of channel and partner marketing for the mixed reality business at Microsoft, told Channel Futures. The Agency Readiness Program had about 25 members, globally. At last year’s Microsoft Inspire, the vendor invited system integrators, resellers and some ISVs to apply for the Mixed Reality Program. “Today the program is multifaceted. We work jointly with our partners – about 100 – on sales and marketing, account planning, pipeline management. We also offer post-grad training, and partners get access to our product team that builds the product,” Corriveau said. While Microsoft’s use of the term Mixed Reality refers to having both AR and VR solutions in its portfolio, Mainelli strips away the verbal confusion to put AR/VR in perspective: If you can see through it, it’s AR; if you can’t, it’s VR. AR uses a different type of headset than the one that used with VR. Most VR headsets are tethered devices — that’s not the case with AR. VR is when you put on a headset and you’re transported to another reality. “You can use a VR headset in an enclosed area and move around if it’s not tethered, but it’s not something you put on and walk the manufacturing floor or go outside with because it obscures your view,” he explains. By contrast, the underlying premise of AR is that you see what’s going on around you and your existing reality is augmented with new information. Microsoft’s HoloLens falls in the AR category. It takes 3-D objects, holographic objects, and drops them into your reality. The user can interact with and manipulate those 3-D objects. In fact, Microsoft HoloLens is a self-contained holographic computer running Windows 10. The Development Edition costs $3,000. For $5,000, Microsoft offers a Commercial Suite for organizations. It includes the Development Edition hardware plus a warranty — and enterprise features for added security and device management. There’s a short list vendors – in addition to Microsoft – creating AR headsets: ODG, Epson, Daqri, Meta, Vuzix, to name the top ones. In mid-January, Dell announced that a partnership with Meta to resell the Meta 2 AR Development Kit. Dell also is planning to offer “AR in a box” kits, currently being prepped for distribution. Next month the company will announce specific software solutions for the kit. VR headsets are much less expensive, costing as little as $300. Microsoft also sells VR headsets from the likes of Lenovo, Dell, HP, Acer and Samsung. “These products are based on Windows 10 and your typical PC vendors are shipping the products. There’s a fair amount of interest from companies who have been a little hesitant to jump on board with an HTC Vibe or Oculus Rift,” said Mainelli. The latter two vendors don’t have existing relationships with the PC vendors, and potential business users are concerned about managing the devices; typically they are familiar with Windows 10. Mainelli also highlighted two new devices, introduced earlier this year at CES, that up the ante for VR products. The HTC Vibe Pro is a more professional version of the HTC Vibe that is wireless. Lenovo’s Mirage Solo is a standalone headset that supports Google’s Daydream virtual-reality platform. It’s based on the Qualcomm Snapdragon 835 VR platform. The tethered nature of VR devices has been a bottleneck to greater adoption in the workplace. That said, a lot of companies are looking at VR for their business, across the gamut of use cases — for example, employee training, product creation and customer service. Walmart is a case in point. The multinational retail corporation uses VR to train its store associates. AR has more promise for business users, but it’s early in the game. Today, a lot of AR is happening on the phone — but that’s not the end game. Both Apple and Google announced SDKs to bring AR to iOS and Android platforms, respectively. These vendors weren’t the first to do this. PTC has been bringing AR to tablets and phones for years. 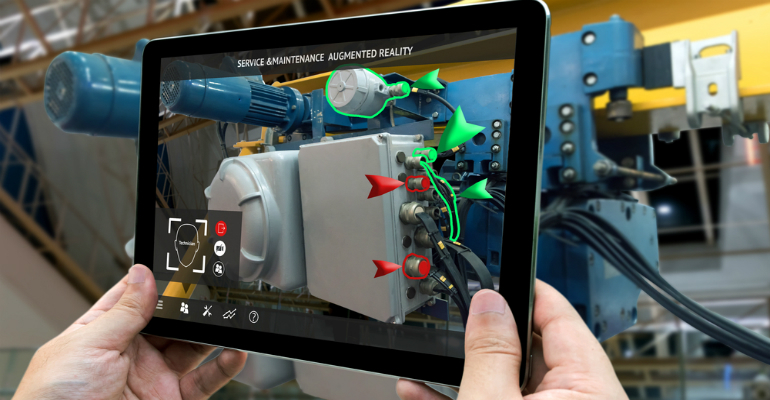 ThingWorx Studio is a code-free authoring environment that brings AR experiences to industrial companies. “There’s a huge installed base of employees who use both hands while they’re working, so they cannot use a tablet or phone. The ultimate promise of AR is to put it on your head in the form of a pair of glasses,” Minelli said. This allows employees to do their jobs better, more safely and more efficiently. Expect to see that switch flip in the not-too-distant future as development costs drop and applications begin to roll out. Microsoft Mixed Reality Partner Program pioneer and member Ivan Evdokimov, CEO and founder of Zengalt, has a goal to make it easy for companies to create HoloLens content without writing code. The company has developed a platform called Vyzn. Zengalt worked with the City of Seattle to present zoning changes to the community using the HoloLens/Vyzn model. Evdokimov says the enterprise market is in the early stages, with many companies trying to figure out where the technology fits in their businesses. But he doesn’t expect that this will be the case for too long. “HoloLens is a device that replaces parts of the real world with anything you want. Our goal is to lower the barrier to entry to this technology for business customers,” he said. Object Theory is another Microsoft Mixed Reality Partner that joined the program early on. Object Theory focuses its application development for enterprise Fortune 1000 companies. “We’re finding a lot of traction in this space, particularly among companies that are already working with 3-D content but feel limited by the ability to only visualize it on a 2-D monitor,” Raven Zachary, the company’s co-founder, shared with us. His top-five vertical markets for AR: architecture, engineering and construction; health care; aerospace and automotive; manufacturing; and defense and public sector.